When it comes to classroom learning ideas, free and cheap ways to help kids learn are the way to go. I've seen many teachers who use their own income to purchase supplies to better their classroom or help their student's educational needs. Most teachers that I know love any tricks that will help their students learn, focus, and pay attention during the school day. Adding movement and sensory input into the classroom is a way to help kids pay attention through multi-sensory experiences. Kids respond to sensory input and motor-based learning and may retain information better when learning new information. Try these free classroom sensory motor ideas and inexpensive ways to add sensory motor input into the classroom. 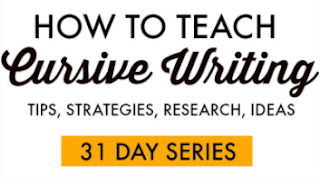 These activities are easy to add into classroom lesson plans. 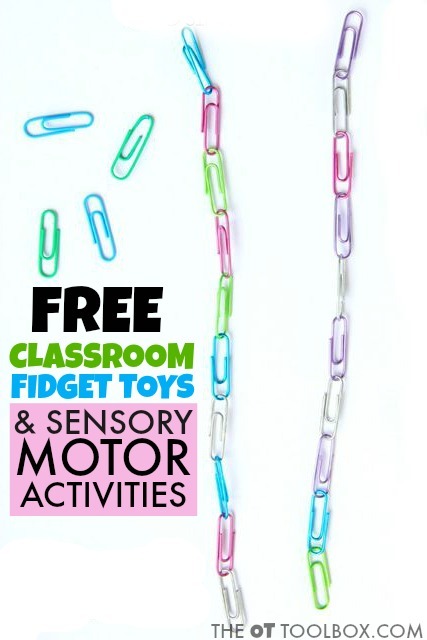 Most of these free classroom sensory motor ideas use tools that are already in the classroom or don't require any extra items at all! Movement breaks- Schedule brain breaks or movement between activities, before handwriting. 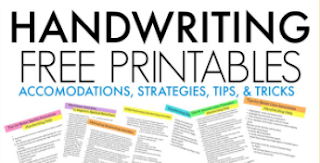 Try these handwriting warm-up exercises. Toss a ball- When kids are answering questions, toss them a soft ball. Then can catch it and then answer the question. Stand close (tossing a ball across the room might not be a great idea). Use a soft ball like these water balls. Dollar stores have these types of balls available during summer months. Or, use a ball from the school's gym/recess supplies. Head, Shoulders, Knees, and Toes- The movement song "Head, Shoulders, Knees, and Toes" makes a great learning rhyme. They words can easily be substituted for math facts, vocabulary words, or other terms that need to be memorized. Add the movements to the song to make it a gross motor activity. Paper clip chain fidget toy- Kids can make a short paper clip chain fidget toy that can be used as a learning tool and as a sensory fidget tool. The paper clips can be stored in the students' desks or pencil boxes and used as a fidget toy during learning. They can serve another purpose as math manipulatives or for hands-on sight word activities with play dough. Use the paper clip to hold sight word flash cards and press them into play dough. When children make their own paper clip chain, they are building fine motor skills, too. Try any of these DIY fidget toys as an option that would work in the classroom or in the home. Water with a straw- The whole class can benefit from the calming oral motor benefits of sucking from a straw. Add ice cubes for an alerting tool. This is certainly not easy to accomplish in most classrooms, but something to keep in mind. Try these alerting snack ideas. Quiet corner- Use a cardboard box to create a quiet corner that students can climb into. Add blankets, soft pillows, and twinkle lights. A small bin of books and a box of calming sensory tools are great additions. This can be a place that kids go to whether they have sensory issues or not. Toss large pillows- Use bed pillows with a pillow case and light weights added inside the pillow case. A bag of dry beans or rice work well as weight. Sew the pillow case shut and then place the whole weighted pillow case inside another pillow case that can be washed as needed. This weighted pillow can be used during question and answer sessions like the first example above. Tossing the pillow back and forth is a great way to add heavy work into the classroom. Students can even line up in two lines and toss the pillow back and forth to other students during the lesson. When not being used in learning activities, the DIY weighted pillow can be used in the calm down corner of the classroom or placed on student's laps who need a little more calming proprioception during the school day. 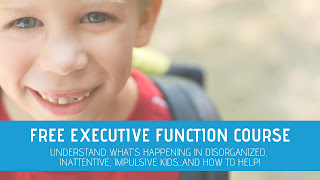 Chew gum- Chewing gum is an inexpensive way to add calming proprioception to learning activities. Chewing gum has been shown to increase alertness. Use sugar-free gum. While this isn't a completely free activity, it is an inexpensive tool for sensory input in the classroom. Heavy work jobs- Students can be an active part of the classroom, helping out to keep the room in order. Proprioception activities that can easily be added to the classroom include: moving desks, carrying stacks of books, pushing a loaded cart to other rooms in the building, bringing a bucket of lunch boxes back from the school cafeteria after lunch, helping to move gym mats or other equipment, cutting through card stock for bulletin boards, stapling bulletin boards to decorate each month, placing chairs on desks at the end of the day, and pulling them down at the start of each day. Get the above list in a printable version for the classroom. 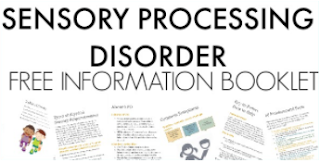 This is a free resource for parents, teachers, and therapists. Click Here to Get the Free Printable sheet. Click the image above to get your free printable sheet. This is perfect for adding to school recommendations, handing out to teachers, and using in consultation services.